Throwing your hair into a ponytail has always been a popular go-to style because it’s super quick and easy. 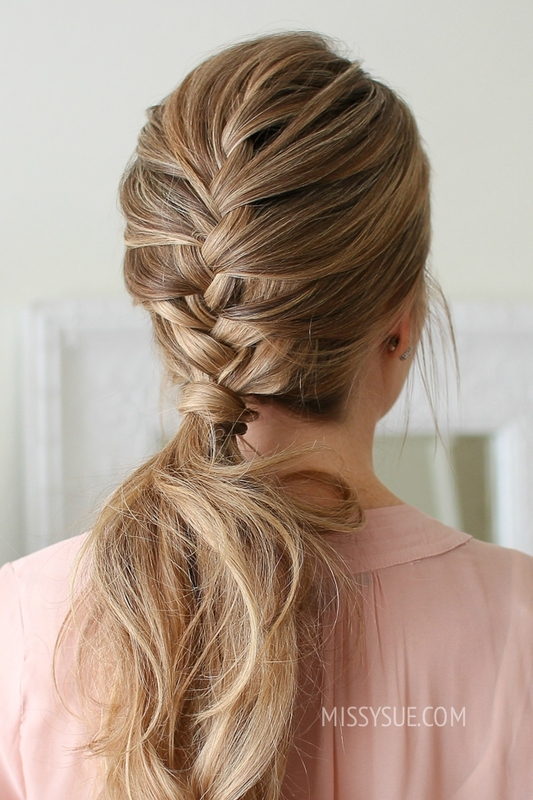 A fun way to elevate your everyday pony is by adding a cute french braid into the mix. For today’s tutorial, I thought it’d be fun to recreate this older tutorial so you could see an updated version. I love this style for everyday and it literally takes me minutes to do. To prep my hair for this hairstyle, I curled small sections with a 1 1/4″ curling iron. Step 1 / Begin by parting the hair where you normally part it; you can also do this style without a part. Step 2 / Pick up a section of hair at the crown and divide it into three pieces for the braid. Step 3 / Cross the left strand over the middle and then cross the right strand over the middle. Step 4 / Now cross the left strand over the middle, pick up a new section of hair and cross it over the middle strand as well. Step 5 / Then cross the right strand over the middle, picking up a new section of hair and cross it over and into the middle strand. Step 6 / Repeat those steps crossing the side strands over the middle strand while adding new sections into the braid until it reaches the nape of the neck. Step 7 / Then braid the hair a little further down and tie off the end of the braid with a clear elastic band. Step 8 / Now combine all of the hair together and tie it into a low ponytail. Step 9 / Once it’s tied off, remove the elastic band from the end of the braid and unravel it. Step 10 / Then take a small section of hair from the ponytail, wrap it around the hair band and secure the wrapped piece with a clear elastic band. I have more of a thick hair texture and it is a little harder for me to do some of the styles. Do you have any tips for me?